Full Title: Integralno dićhipe sićimašće inkluzijako: ažutipe rane barjarimasko ande funkcija e prevencijako katar o inklistipe andar o sićimasko sistemo ke rromane čhavorra, Integrisani pristup obrazovnoj inkluziji: podrška ranom razvoju u funkciji prevencije napuštanja sistema obrazovanja kod dece romske nacionalnosti. 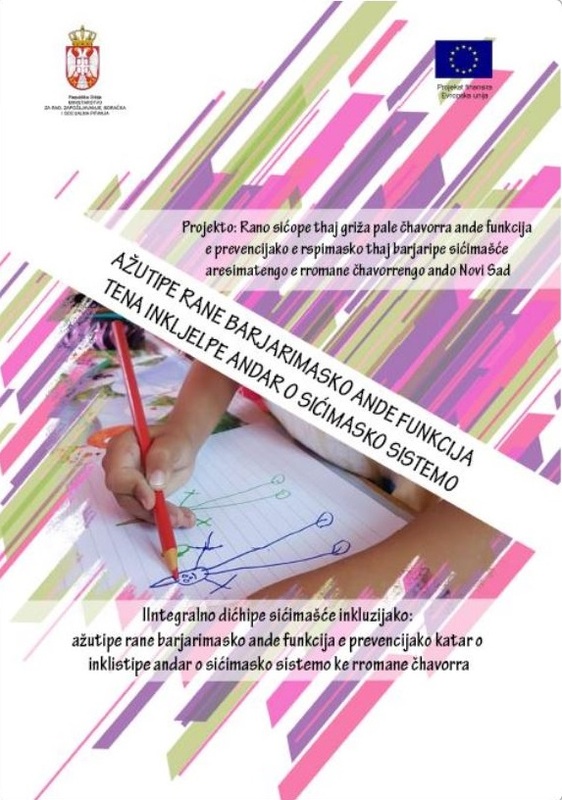 The manual was created within the framework of the "Early Childhood Education and Care (ECEC) in Function of Preventing Dropout and Increase Of Education Attainment of Roma Children in Novi Sad" project, implemented by the Know How Center in partnership with the Center for Social Work of the city of Novi Sad and the City of Novi Sad Education Administration. The project was financially supported by the European Union under the IPA 2013 program - Development of effective community-based services in the field of education and social protection at the local level. The manual “ECEC in function of dropout prevention of Roma children” promotes an integrated local approach to education inclusion of Roma children. The manual can be useful to different stakeholders in different ways: civil society organizations can use it to support similar approaches and professionals in primary and secondary schools can use it to facilitate the implementation of all legal obligations aiming to prevent pupils from dropping out, by the following concrete guidance and implementing inspirational activities at school level. For representatives of social protection, the manual can serve as a guide for working and cooperating with relevant local actors. The manual contains 1) methodology of outreach work in informal Roma settlements, 2) methodology for establishing and working in school dropout prevention teams including action plans and providing psychosocial support to children, and 3) local intersectoral networking model as an example of the noteworthy practice at the local level.